A large character area on the southern edge of Mynydd Preseli. The majority of it is in modern Pembrokeshire, within the medieval Cantref Cemaes. That the character area was a centre of ecclesiastical significance during the early medieval period is demonstrated by the establishment of one of the seven pre-Conquest 'bishop-houses' of Dyfed at Llandeilo Llwydarth, mentioned in the 12th century Liber Landavensis. Two Early Christian Monuments from the church are now in Maenclochog Church. Cemaes was brought under Anglo-Norman control by the Fitzmartins in c.1100. The Fitzmartins retained it, as the Barony of Cemaes, until 1326 when they were succeeded by the Audleys. The Barony was conterminous with the later Hundred of Cemais, which was created in 1536, but many feudal rights and obligations persisted, some until as late as 1922. Most of the Llangolman character area belonged to the mesne lordship or manor of Maenclochog, held from the Barony of Cemaes by the Roche lords of Llangwm in the 13th- and 14th-century when it was assessed at one knight's fee. By 1594, Maenclochog had its own court leat and was - like other Cemaes manors - held on an annual lease from the Barony, this one being assessed in an Extent at 3s 8d. 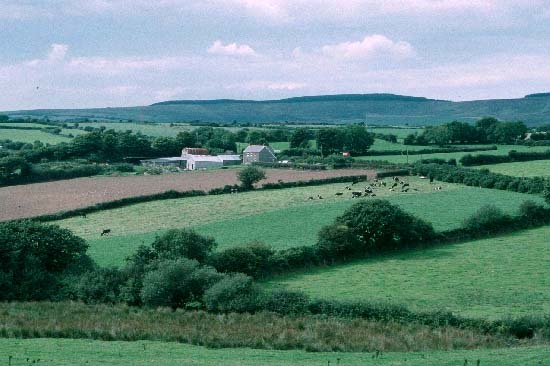 However, like most of the southeastern part of the Barony, within Mynydd Preseli, this area continued to be held under Welsh systems of tenure. The ecclesiastical framework was nevertheless reorganised upon Anglo-Norman lines and Llandeilo Llwydarth along with the chapel at Llangolman to the east were annexed to the vicarage of Maenclochog, which in turn was granted to St Dogmael's Abbey by David de la Roche in c.1320. At the far east end of the area is the parish church of Mynachlog-ddu which was part of a much earlier grant to St Dogmaels, in 1118, as part of the grange of Nigra Grangia granted by William Fitzmartin, and which was, after the Dissolution, held distinct from the Barony of Cemaes. The grange chapel of 'St Julians' or 'St Giles' (ded. St Silin) may also have occupied the area. By the late 15th-century, considerable lands within the Llangolman character area had been amassed from the manor of Maenclochog by a local yeoman family, the Llywelyns, but in 1498 they granted 'all their lands in Llangolman and at Bwlch-y-clawdd (Temple Druid) in Maenclochog', which were held by Welsh tenure, to Lewis ap David ap Gruffudd Fychan of Llangolman, yeoman, 'on account of great necessity and poverty'. The pattern of dispersed settlement is typical of native tenurial systems, and the vill recorded at Llandeilo Llwydarth appears never to have become a nucleation, while the pattern of enclosure with regular fields of medium size is characteristic of 16th- 17th-century enclosure, under farmsteads such as Pencraig-fawr and Plas-cwrt which were recorded in the 16th century, while a deer park at 'Loydarth' was also recorded in the later medieval period. The process of enclosure was complete by the late 18th-century. However, though the Ty Mawr estate map of 1777 shows most of the holding as today, a few unenclosed dispersed strips within other farms holdings are also shown, suggesting that this landscape had evolved out of a system of sub-divided strip-fields, in this case probably lleini held under Welsh tenure. Other 18th century gentry houses existed at Plas-y-Meibion, and Temple Druid which was rebuilt by John Nash. A small part of the character area to the southeast lies in Carmarthenshire, and in the middle ages belonged to Llwyn-yr-ebol, a grange of Whitland Abbey which was granted to the Cistercians by Maelgwn ap Rhys, son of Rhys ap Gruffudd, between 1197 and 1231. It is likely that it represents early enclosure of monastic common pasture, probably again from the 16th- and 17th-century. The history of the character area was and still is dominated by agriculture, although it contains Pembrokeshire's densest concentration of slate quarries. A total of 13 named quarries, and several more informal workings, are more-or-less strung out in an east-west line across the volcanic ash slate exposure through the centre of the area. Most of these were rather late, being established from the mid 19th-century onwards. All are now disused but the largest of them - for instance, Dandderwen ('Whitland Abbey Slate') and Lily - occupied a considerable area and brought employment to many hundreds. An additional element is the early Baptist chapel at Rhydwilym, which was founded in 1668 under the benefaction of local gentry families and had, from the first, an exceptional influence over a wide area. Recorded archaeology is rich and diverse. From the neolithic, it includes a scheduled chambered tomb (or standing stone? ), another possible chambered tomb and a possible henge (or vallum enclosure?). From the bronze age are a scheduled standing stone, a round barrow, three possible standing stones and two possible round barrows, and a possible burnt mound. There is a scheduled iron age hillfort and another possible hillfort. Roman artefacts have been found. Early medieval features include the two Early Christian Monuments from Llandeilo Llwydarth (now in Maenclochog Church) and an inscribed stone from Gelli Dywyll. There are two holy wells, the one at Llandeilo Llwydarth with a tradition that the water was drunk from the skull of St Teilo. There is a possible medieval strip-field system and several mill sites, as well as the church and chapel sites. Post-medieval archaeology includes a wealth of quarry features including buildings, a sawpit and a world war two searchlight battery on Llangolman Common. 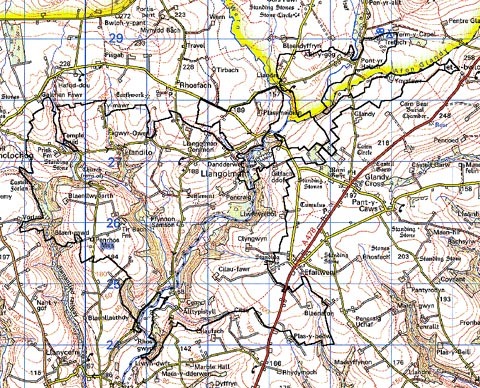 Llangolman historic landscape character area is well defined to the north where it bounds Rhosfach and Mynachlog-ddu areas and to the east against Glandy Cross. To the south the boundary is less clear, although the area to the south consists of larger farms and larger fields than those of Llangolman. A definite boundary does not exist, but rather a zone of transition extending for perhaps one or two kilometres.